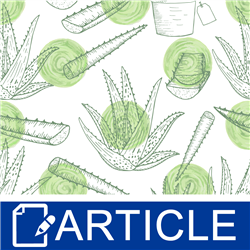 Aloe Vera is one of the most commonly used botanicals in both commercial and handmade products as it has such great properties for skin and hair. It acts as an anti-inflammatory, anti-bacterial, and anti-oxidant while it hydrates, speeds up wound and burn healing, brightens, soothes irritated skin, reduces transepidermal water loss and redness, and promotes a more even skin tone. Phew! Let’s take a look at a few of these compounds that make aloe vera so fantastic! Aloe vera liquid feels a little slippery and gel-like thanks to polysaccharides like acemannan, which are insoluble fibers that form a gel in water that work as hydrators, emollients and anti-inflammatories to soothe burned, reddened, chapped and dry skin by forming a film to trap water in the stratum corneum. Phytochemicals, or plant derived chemicals called anthraquinones, including barbololin, emodin, aloin and aloesin, work as anti-oxidants. They absorb UV light around the same range as our skin would (250 to 300 µm), so they may help prevent sun damage, while both aloesin and aloin work as skin brighteners to reduce the appearance of age spots and promote a more even skin tone. Phytosterols, the oil soluble compounds which make up the plant equivalent of cholesterol, are well known for soothing wind chapped, sun damaged, sun burned and irritated skin by reducing inflammation, redness, itching and transepidermal water loss. They also soften hair and reduce electrical charges, so you won’t zap your loved ones with a touch during dry months or have too many fly-a-ways. Alprogen, a glycoprotein or protein with an attached sugar, is a good anti-allergen, skin thickener and cell proliferator, which can lead to increased wound healing or an increase in skin’s barrier repair mechanisms, while flavones behave as free radical scavenging anti-oxidants that are as effective as BHT or tocopherols. Wow, how can one little plant contain such multitudes? I’m sold! How can we use this in our products? In general, I use water soluble versions of aloe Vera liquid or extract, like Crafter's Choice Aloe Vera Extract - Water Soluble, at 10% in the water phase for lotions, toners, facial cleansers, body washes and more, which is more than enough to receive the benefits of all these amazing compounds. As aloe vera contains electrolytes, or compounds that when dissolved in water conduct electricity, it can thin out the viscosity of products made with foamy, bubbly surfactants, polymeric or cold emulsifiers, traditional emulsifiers or gelling agents, so stay close to 10% lest your lovely bubble bath turn to water before your eyes! I have a lovely facial cleanser I make with Crafter's Choice Clear Conditioning Shampoo at 20% along with 10% aloe vera liquid or reconstituted aloe vera, 0.5% preservative and 69.5% distilled or reverse osmosis water and pour into a foamer bottle. You can use aloe vera gel neat for sun or apres sun care products, or you can add a botanical extract or three, like up to 5% Crafter's Choice Chamomile Extract - Water Soluble, Crafter's Choice Calendula Extract - Water Soluble, 5% Crafter's Choice Cucumber Extract - Water Soluble, to soothe irritated skin. As an aside, it’s easy to make a fantastic glitter gel by combining 93% aloe vera gel and 7% Crafter's Choice Super Sparkle White Diamonds Mica Powder as a highlighter or a more “night on the town” sparkle gel with 7% Crafter's Choice Super Sparkle Light Gold Mica Powder. 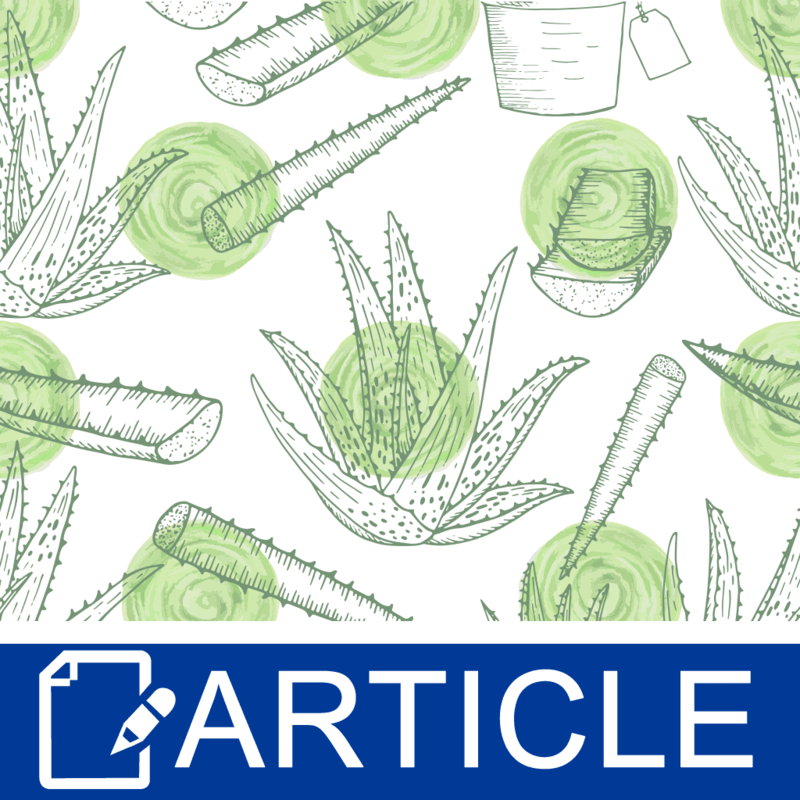 To get all the goodness of aloe vera in anhydrous products, like lip balms, lotion bars, whipped butters, or balms, choose an oil soluble version, like Crafter's Choice Aloe Vera Oil – Golden, Crafter's Choice Aloe Vera Oil – Clear, or Crafter's Choice Aloe Butter Blend. Use these in the heated oil phase of lotions or conditioners, or in any product sensitive to electrolytes. Crafter's Choice Aloe Vera Oil – Golden packs an extra punch thanks to the soy bean oil, which contains high levels of Vitamin E, loads of phystosterols to reduce inflammation, and linoleic acid, a fatty acid that speeds up skin’s barrier repair mechanisms. I use it at 15% in lip balms and cuticle balms, at 20% in whipped butters as the liquid oil, or up to 30% in lotion bars. My favorite whipped butter contains 30% Aloe Butter Blend; 50% Crafter's Choice Shea Butter - High Melt, Ultra Refined; 19% a less greasy feeling oil like evening primrose, hazelnut, macadamia nut, or meadowfoam seed oil; and 1% fragrance or essential oil. Fragrance it with Crafter's Choice™ Aloe Water & Cactus Fragrance Oil or Crafter's Choice Green Aloe & Clover* Fragrance Oil and you have yourself an aloe packed emollient party! Or keep it simple with 80% Aloe Butter Blend, 19% oil, and 1% fragrance or essential oil. How can you say no to an amazing botanical extract that can be used in so many different ways? Get into your workshop, and start formulating! "I would like to make face mask kits. The dry ingredients will be packaged separately from the wet ingredients. I would like the kit to include a small bottle of 1X Aloe vera liquid to be mixed with the dry ingredients by the customer at the time of use. Does the bottle of Aloe Vera Liquid need to be preserved? If so, what preservative do you recommend and at what rate?" Staff Answer If you are reconstituting the aloe vera powder, you would need to add a preservative. We would recommend Preservative-Water Soluble (Germaben II) or Preservative-Water Soluble PF (Germall Plus). The recommended percentages are listed under Directions & Ingredients.